Recently I had a Snapchat friend to request a blog post on neutral wardrobe pieces ... including where to splurge and where to save. She is a mom of three, all 4 and under, so she is looking for easy pieces she can throw together that look chic but are still conducive to playing on the floor with kids and nursing. And truth be told, I am not strictly a "neutrals girl." If you've been reading here long enough, you've seen me wear my fair share of colorful Lilly prints, animal prints, and bold stripes. But there is something simple and classic about neutrals, and truth be told, they are SO easy to pair together that you could *almost* get dressed in the dark, ha! So, where to splurge and where to save. You know I'm all about saving. In fact, I'm only really thinking of one item to splurge on -- jeans! Mainly because I think the cost of a great pair of jeans is justified if you consider the price per wear. I have three pair of jeans that I love the most: a pair of C. Wonder jeans I bought in Atlanta (man, I miss that store) on sale for around $60, an elastic waistband pair (more like jeggings) I got for a song at Old Navy, and a pair of Joe's skinnies that I actually picked up at Plato's Closet. That's a great place to find nice designer jeans on the cheap. I love to wear black, so I have black tops that are sleeveless, short sleeved, and long sleeved. I also love wearing ivory/winter white and camel. Recently I posted about some very inexpensive Faded Glory tshirts that I found at Walmart. I bought several colors but the ones that I wear the most are heathered charcoal gray and a cool military green color (which I totally consider a neutral). I don't spend a ton on trendy items (like those $34.99 booties above ... so much easier on the wallet than their Rag & Bone counterpart). I'd rather pick those items up at stores like Old Navy, Target, even Walmart. I guess the only other pieces I splurge on are jewelry! 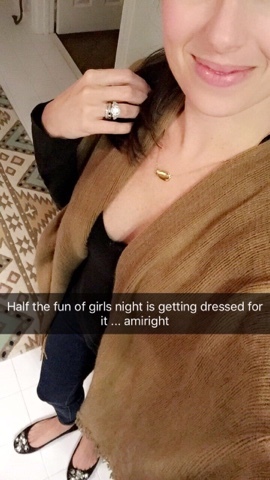 I think that with a few great long necklaces, a dainty short necklace or two, some nice non-costume rings and maybe some gold bangles, you are set. Oh! And earrings. Diamond or rhinestone studs, one pair of small pearl earrings and one pair of large faux pearls, and a pair of medium-sized gold or gold-toned hoops and you're ... well, golden. Not the cheapest, but great for a Christmas list! They go with everything and make such a statement. And of course a shameless plug for my sister's amazing necklaces. Laura has SUCH an eye for color and texture. I'm often wearing a necklace she made. 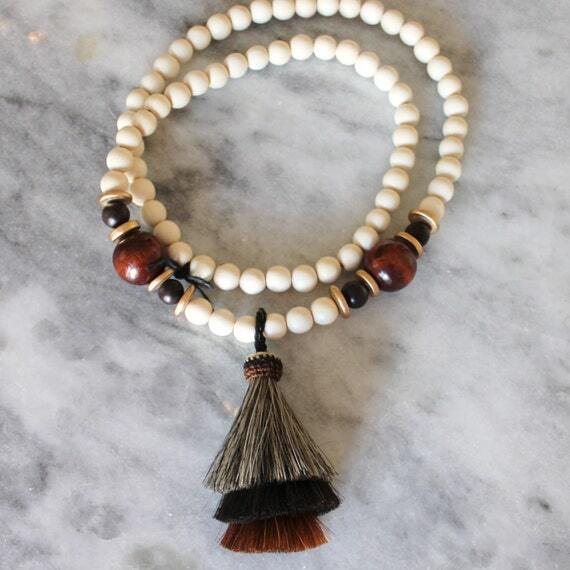 She has great neutral necklaces like the one below, and some awesome colorful wooden bead necklaces that look so pretty over a neutral v-neck and pair of jeans. You can REALLY spend a boatload on a statement necklace that is "on trend" ... but that's not really my style. I think Laura's are priced so fairly. A denim/chambray button-down (I have two, both from Banana Republic). 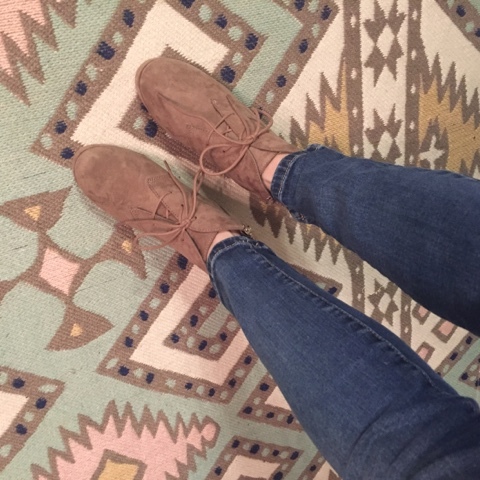 Skinny ankle-length jeans in a dark wash.
Black, brown, or dark gray leggings. Thick enough to conceal lumps, bumps, and undies. 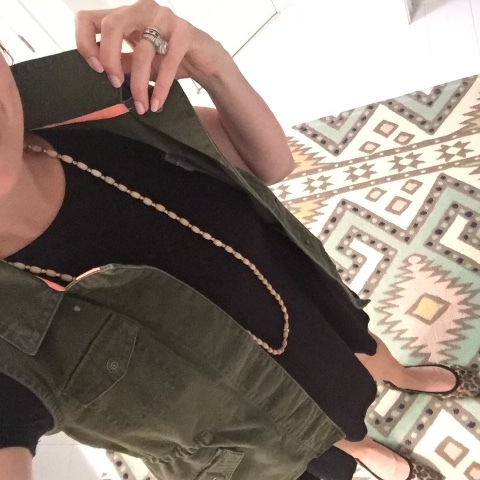 Trendy accessories like a plaid blanket scarf, military vest, and booties. Comfy flats in black, brown, and animal print (Ja-vies are my go-to here). Pretty, classic makeup -- can't go wrong with long black eyelashes and a wine-stained lip! What's your recipe for the perfect neutral outfit? Love all your ideas for mixing and matching neutrals! I'm totally a color & print girl, but there is something about neutrals that is refreshing this time of year! This is such a great post! I love your sister's jewelry and you're right....her prices are super fair! I'm such a neutral girl in the winter, it's just so easy to throw on and layer black, white, gray, cream, etc. Can I ask for info on the bed in the background? Been thinking of ordering a full upholstered bed like that but I have always just had headboards and not sure if I will like it? Or how low it will be/how it hides the box spring. So many questions that I can't tell from looking online.